There are two fruit fly species of economic importance on deciduous fruit, Mediterranean fruit fly and Natal fruit fly. Their biology and life-cycle are virtually identical. Under favourable conditions female fruit flies become sexually mature and capable of laying eggs about 5 days after they emerge. After mating they actively seek out ripening fruit, and deposit their banana-shaped eggs in a small cavity just below the skin. Oviposition (sting) sites appear as small brown spots on the surface of the fruit, under which is a cavity with one to more than 20 eggs. After 2 to 3 days in favourable conditions the minute, transparent larvae hatch and start feeding on the flesh of the fruit, slowly tunnelling towards the core. The larvae have a sharply-pointed front end with no obvious head, and a blunt rear end, and become cream-coloured as they get older. Early infestation is often indicated by a brown colouration of the fruit flesh in the area of feeding due to oxidation of the tissues. From about 7 to 40 days later, depending on fruit kind and temperature, the larvae reach maturity (8 to 10 mm long), when they leave the fruit, fall to the ground and pupate just below the surface of the soil. About 8 to 40 days later, depending on temperature, the adult flies emerge from the pupae, crawl up to the soil surface, and the cycle is complete. 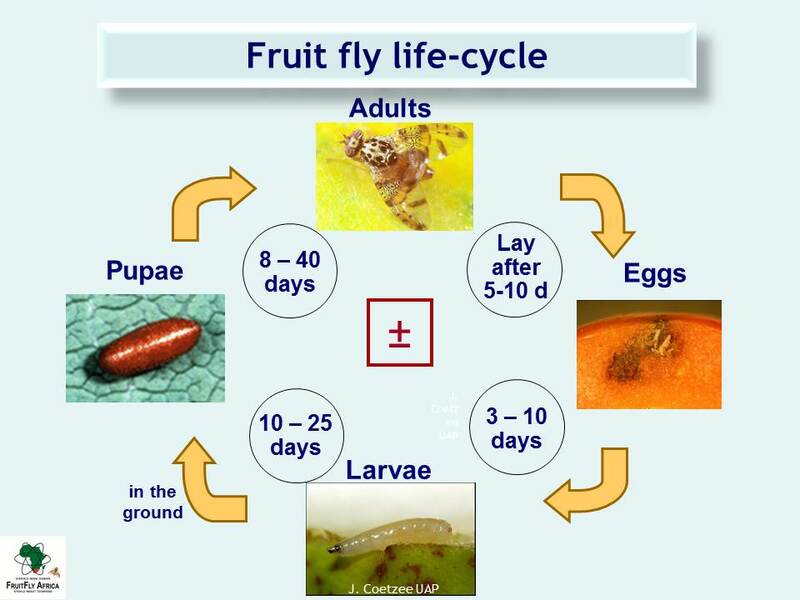 During warm conditions and in ripe fruit, the life cycle can be completed in as little as 3 to 4 weeks. This duration can increase to about 2 or 3 months in winter or where eggs are laid in greener fruit.